Sometimes you want to give a burger place a second chance. DON'T! The last time that we visited The Hole in the Wall Burger Joint for a cheeseburger, we walked away unsatisfied, but at least we weren't angry. Today.....angry and sad. They called this The Working Man's Gourmet Burger. They must think that the working man has a busted palette. The Beef--over-manipulated, coarsely ground chuck. Juicy and lean, but not flavorful--it had no character and no depth of flavor. The beef was chewy and very dry. The Seasoning--SALTY--way too salty---In N Out salty--yech. The Bun: The "old-fashioned" bun--too big, too chewy. 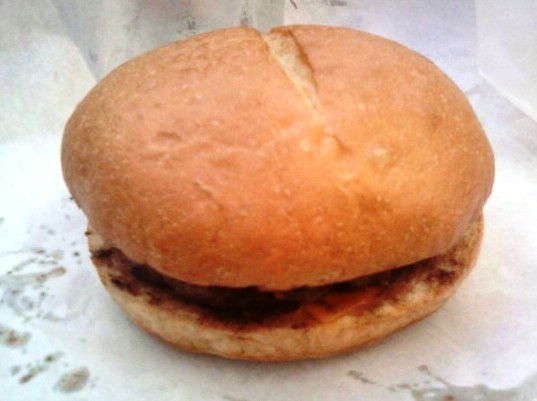 The pretzel bun--tasted of molasses, and that made no sense with a burger. The Fries: These were gummy and actually tasted like dirt. The house-made ketchup is water, bitter, and chunky. YUCK. It tasted like acid reflux. The Value...poor. $8.00 for bland Chuck on a big chewy bun. 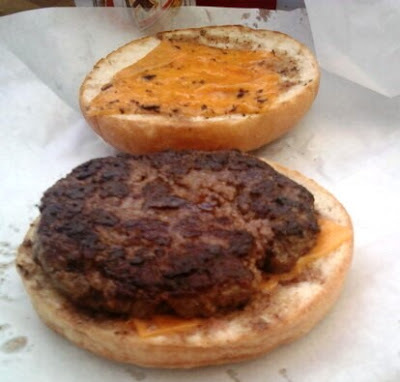 Burger Review : Don't bother--the quality has gone in the wrong direction. Tried the Melrose location a few weeks ago. Judging from your two experiences, mine, and my brother's it seems like HitW is highly inconsistent. My burger was poorly seasoned, no sear, cooked too much on the rare side of med.rare, and had no depth either despite being juicy(decent fat %). The beef is easily overwhelmed by the topping and spread options. Fries and house ketchup are definitely to be avoided. oops, sorry I meant Santa Monica Blvd. Not Melrose!